Having just coordinated, performed at numerous times, and taught hula at a two-day music festival, the amazing Sachiho is ready to rehearse, perform and be the spiritual center of a rock concert honoring her late husband Donto at a large theatre in Okinawa City. It’s an all-star cast backstage in the women’s dressing room before our rehearsal: First row, Sachiho Kudomi, me, Sandii Manumele (hula teacher to 600 students in Tokyo, choreographer of the hula to Donto’s "Nami," and singer of pop and Hawaiian music who can’t even remember how many CDs she’s recorded). 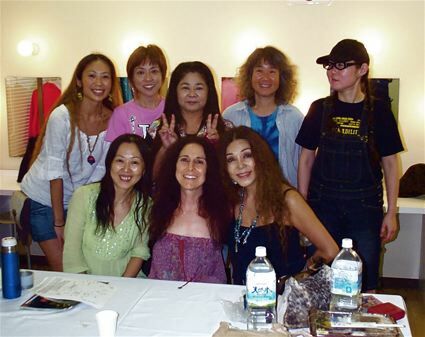 Second row, Kuri (Sandii’s assistant, a fabulous hula dancer), Yoko Nema, Misako Koja (legendary Okinawan singer, who has also released some huge number of recordings, three of which she gave me. They are lovely! 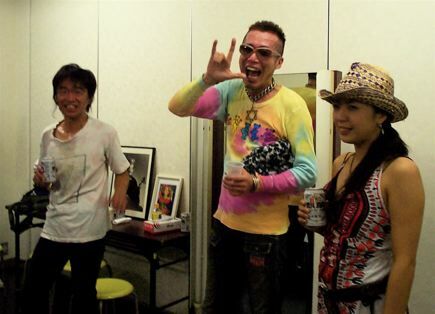 ), Hiromi Kondo, and punk/rock/ska singer Yoko Utsumi. Sandii invited me to visit her, and we traded CDs, too. We rehearsed the entire show. My five minutes of fame came somewhere in the middle of the show, when the huge booming sounds of the rock bass, drums, electric guitar and screaming vocals stopped, and the only sound was me playing Hau’oli La Hanau on a four-string soprano ukulele and gently singing. On the second verse, Amana joined me vocally and instrumentally. I came out again for the grand finale, inwhich international pop star Miya (in sunglasses and white t-shirt; he’s got mega-hits in Latin America and southeast Asia, and pipes like an opera tenor) sang an Okinawan song in duet with Misako Koja, while all of us other women in the first photo sang backup, laughed and danced around. In this rehearsal shot, I’m the fifth one from the right, looking right at the camera. 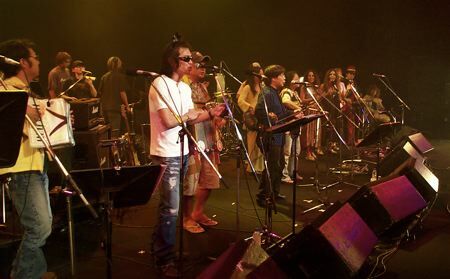 Donto’s original band, piano, bass and drum, performed, along with Donto’s son Rakita on electric guitar, Donto’s singer/rhythm guitarist friend Roku Matsui, and a couple more guys on accordion and washboard, and a famous rock lead guitarist from Tokyo. Yes, OF COURSE there was a shrine at the theatre. Sachiho set it up backstage, with two photos of Donto, one in full Okinawan garb with sanshin (three stringed Okinawan banjo), and one as he looked in Hawaii just before being cremated at age 37. Donto was not Okinawan, but when he moved the family to Okinawa, he embraced it with the same enthusiasm with which he did everything else. 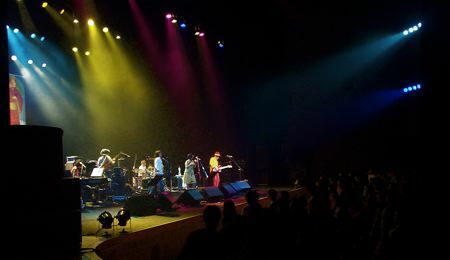 Other than my two moments on stage, I sat with Misako, her daughter and grandson, and watched the show from a tunnel to the left of the first rows. The show opened with Sandii chanting to Pele while Kuri danced hula kahiko. Later in the program, Sandii danced an ‘auana hula in her holoku. I loved the moment when Miya lifted up Rakita on his shoulders, football victory style, and Rakita laughed and continued to play his electric guitar. Donto would have done that. How do I know? Because, before the concert, we were treated to a documentary of Donto’s performances from the ‘80’s and ‘90’s. He dressed in super-creative semi-drag and danced like mad, whipping the crowds into a frenzy. He wrote his songs, he designed his costumes, he sang and played lead guitar. He was a rock god by anyone’s estimation. Sachiho met him when she interviewed him on her radio show, back in the days when she was leading a punk band. After they had kids, they got into a more spiritual bag and moved out of Tokyo. Even seven years after his death, the soul of Donto brought the audience to its feet, waving their arms and singing along to his wonderful songs. Some of his tunes had English lyrics mixed in with Japanese, like his song to Sachiho, “So precious, you are so precious, so precious…” And, as you would expect, the singers onstage pointed their mics to the audience to capture their singing for a couple of lines, the lighting guys then lit up the audience, and that’s how I got this photo without a flash. After the show, everyone who had been on stage gathered backstage for a toast. The kewl dude with the hand jive and the tie-dyed Grateful Dead dancing bear shirt was Donto’s bass player. Under his arm he carries the fake leopard skin cowboy hat he wore on stage. I am clueless as to why he is wearing a huge star of David, but he’s not the only hip Japanese person I’ve seen wearing one. The other guy is Roku Matsui, and I don’t know who the woman is. 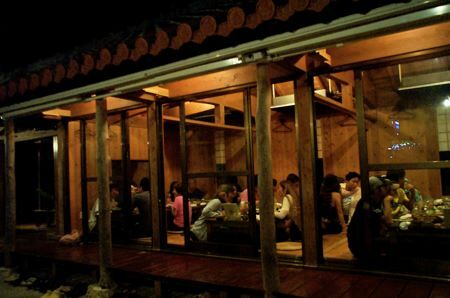 Amana’s manager, Kawashi, who had single-handedly produced the show, took all of us, performers and stage hands, out to dinner at a traditional Okinawan restaurant in Naha City that same evening. The English-speaking stage manager made me get my Traveler Guitar out of Hiromi’s van and show it to all the stagehands, who loved it.